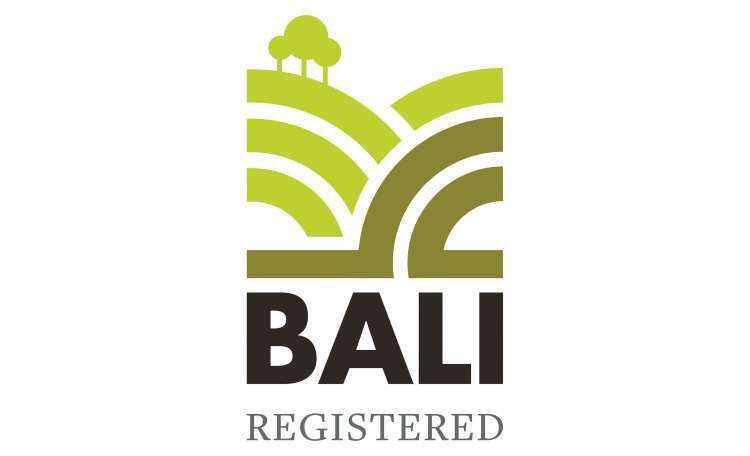 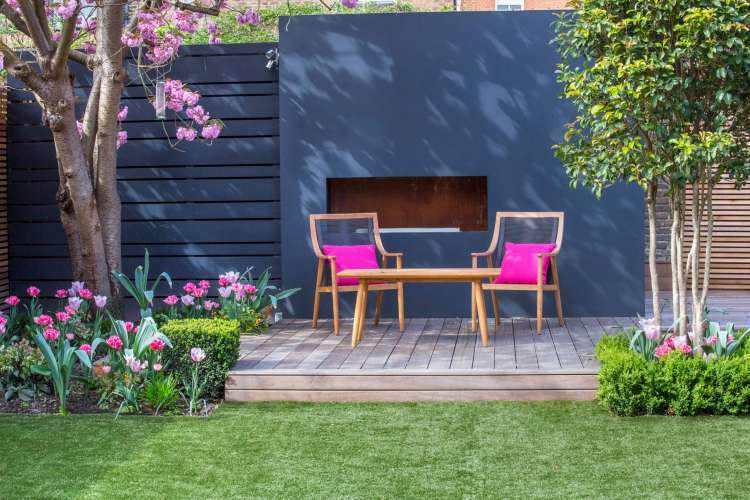 Our client approached us to develop a design that would transform their garden into a series of areas for entertaining, relaxing and dining. 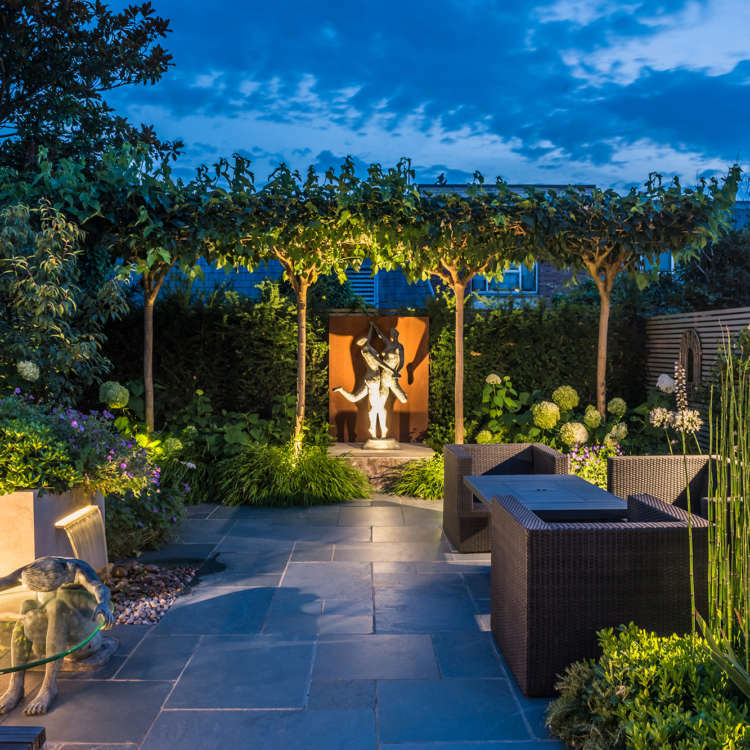 The garden had to have character yet hold consistency that would maximise the sense of space and feel calming. 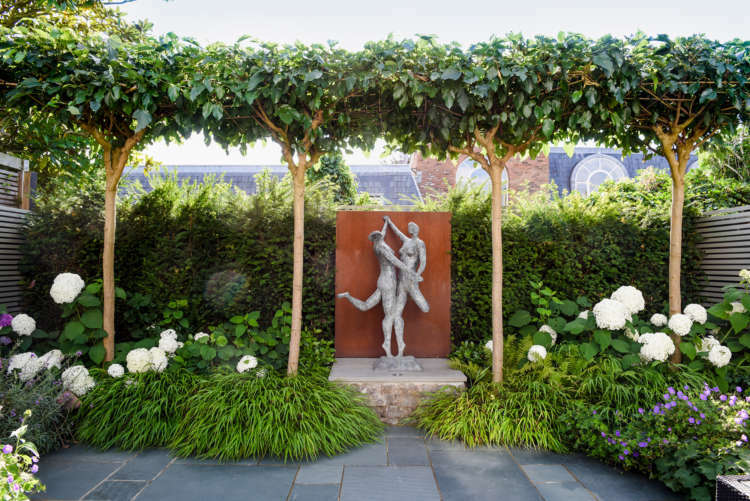 We created a focal point with an existing sculpture and added privacy with established ‘umbrella’ trees and evergreen hedging. 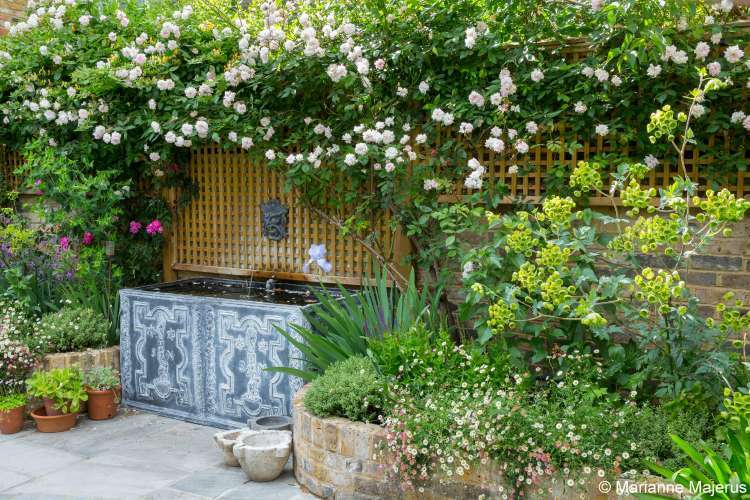 The view through the garden is broken up by planting accommodated in raised beds and at ground level. 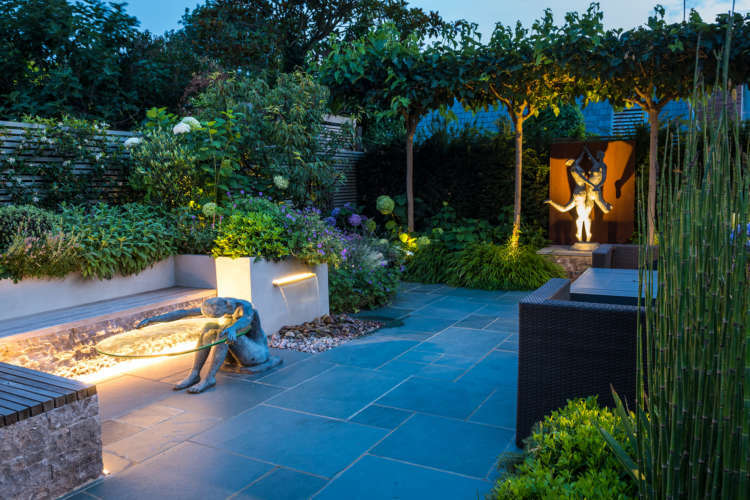 Two water features, using contemporary water blades, have been incorporated and the sound of water draws you into the garden, whilst providing a stunning lighting effect in the evening. 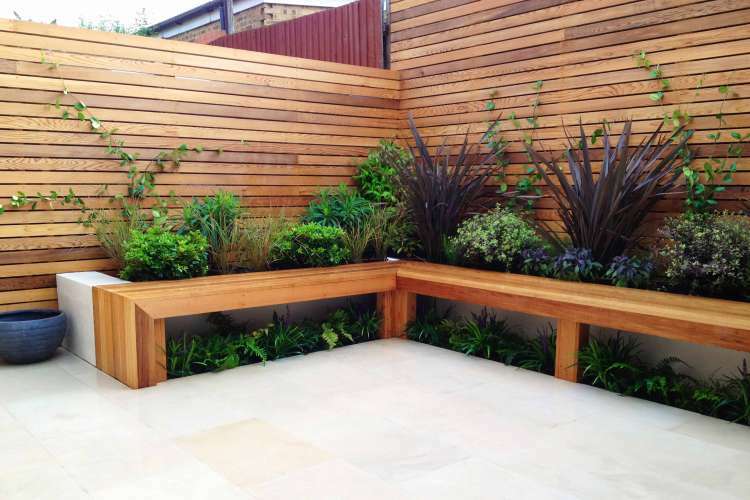 Each area of seating is individually considered and introduced with generous planting. 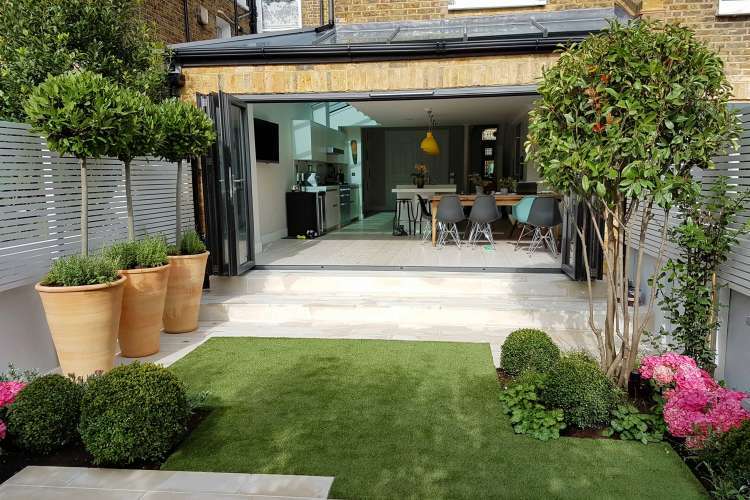 A bespoke outdoor kitchen area was designed and built, with the addition of an adjacent herb garden to provide for the large barbecue. 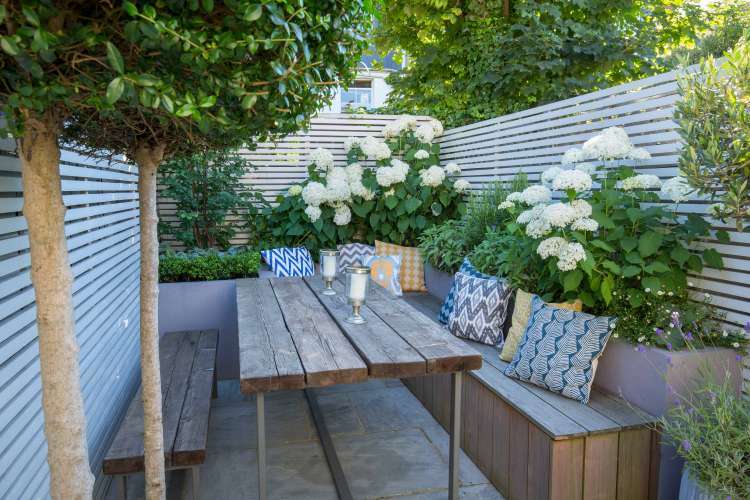 Contemporary battens with a neutral finish offer an attractive backdrop and allow scented Jasmine to climb and soften the boundaries. 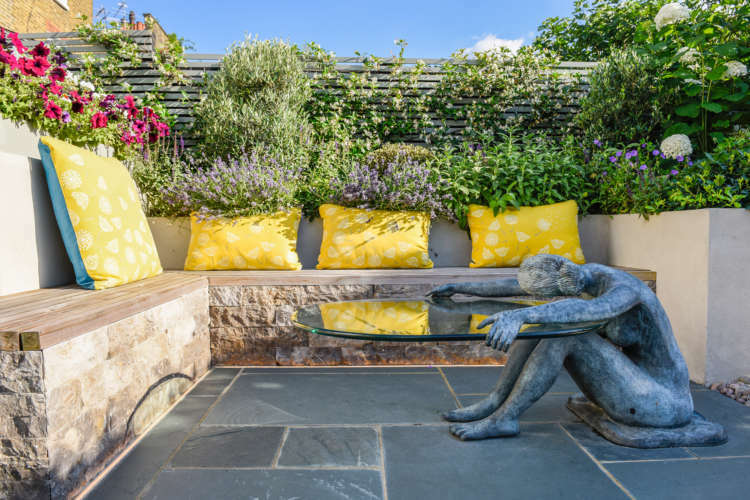 Comfortable seating on each side of the garden enables the homeowners to take advantage of the sun throughout the day, before enjoying the dining space adjacent to the kitchen for al fresco lunches and dinner parties. 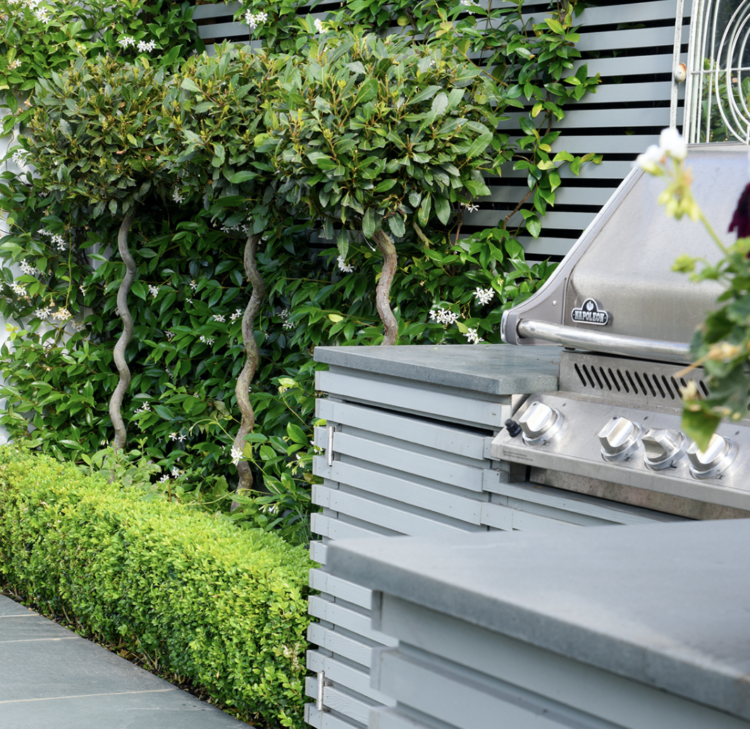 This rear garden provides the perfect sanctuary for our clients who love to entertain and cook outdoors. 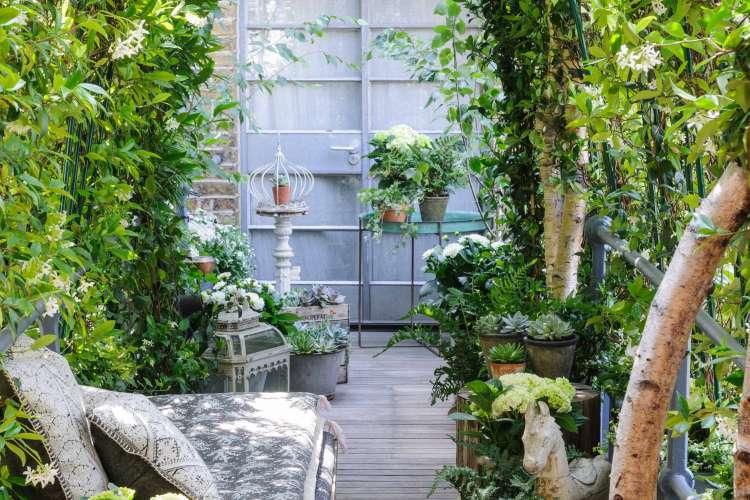 Flowers fill the garden through the seasons and layers of greenery provide structure and add to the sense of calm. 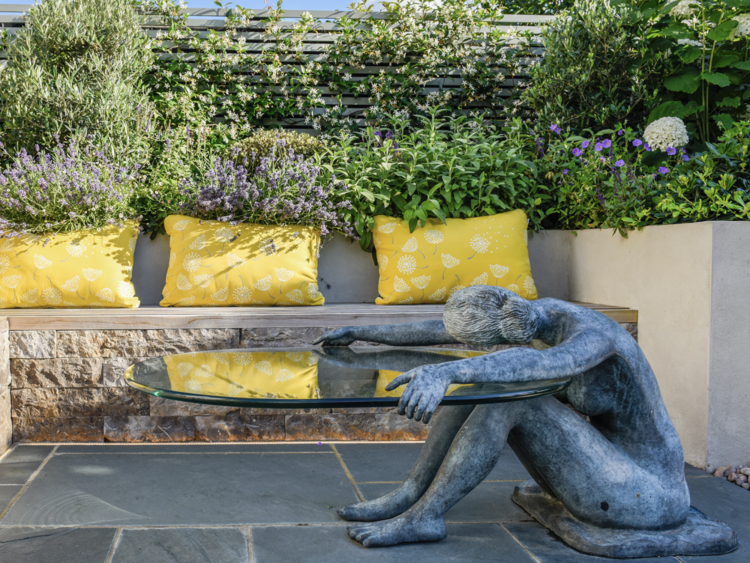 The series of ‘rooms’ gives each area a slightly different feel and whilst the garden includes many features from a kitchen to water features, it retains a sense of space and the view flows from the interior through to the main focal point. 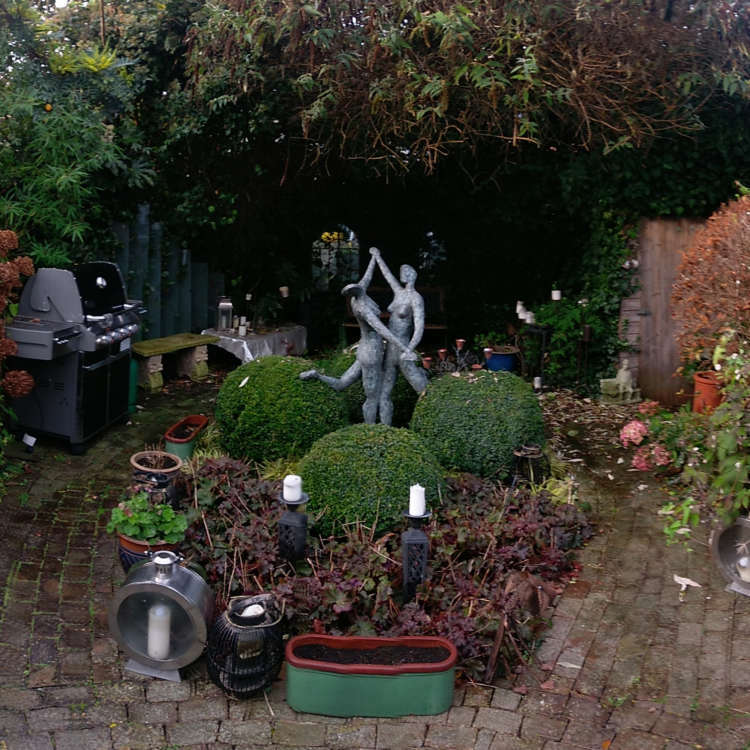 The garden is amazing! 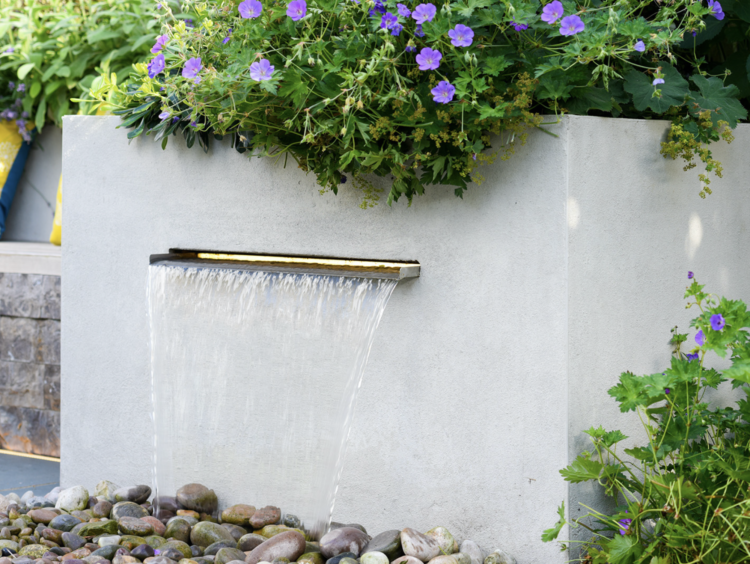 It looks so beautiful and everyone who visits can’t stop talking about it.